Good morning, and what a wet few days we've been having. April is certainly living up to it's reputation. We were so lucky on Thursday when we visited Kelmscott Manor and had such lovely sunshine. Rita is hosting our challenge at the Christmas Card Club this time and she wants to see Christmas Wreaths. This is a 7" x 5" card using an LOTV image. I used lashings of glitter which doesn't show up at all on the picture but actually looks lovely. At Christmas I always wish my front door was red - they always show up a wreath so well I feel. Or maybe a nice shiny black. This is a small 4" x 6" card. 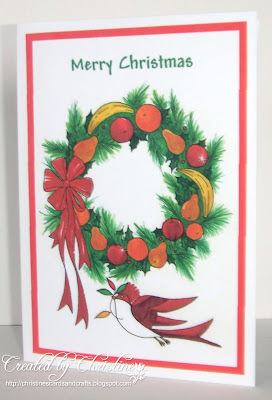 I found this image in the Christmas images section of my Greeting Card Factory de Luxe and thought the fruit made a welcome change from holly etc. Hi Christine, two fabulous cards, lovely traditional one and the card with the fruit is so lovely, perfect for the challenge. Fabulous wreath images on both of these cards. They look lovely and flat for posting too. 2 very super designs and beautiful images. Such a pity about the glitter not showing I bet they look even more amazing in RL. Hope all is well with you and yes this weather is so cold and rab again at the mo. Two great cards, Christine. The fruit wreath looks so good. Isn't it fun to think of all the different things you can use for a wreath. My Mum used to buy a candy wreath made with metallic paper wrapped candies. I still remember how good they were. They were wired to a wreath form and had a wee pair of scissors danging down on a pretty piece of ribbon. She always had that on the front door when we were kids. Your pretty wreaths today, reminded me of that! I love that fun fruit wreath and the birdie eyeing it up . I nearly used an old Christmas card that had a wreath of just Apples on it. Weather has been really cold today. Had to resort to my winter slippers . Hugs Mrs A. 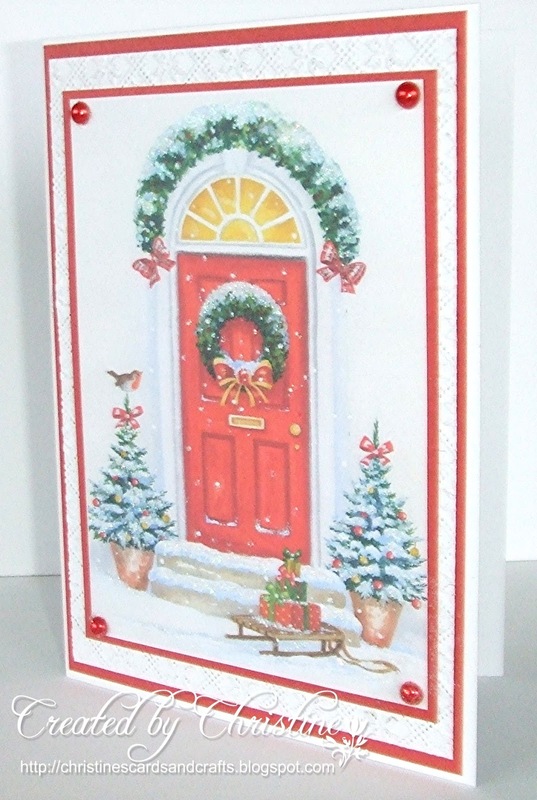 Love the red door with the greenery of that pretty wreath. And especially love #2 with all the luscious fruit. So glad you got to enjoy a nice outing before the rains came. Have a good week, and TFS. Hugs too. Super twofer. You are well on the way with your Christmas cards again. Wish I was that organised. I just tell myself I work better under pressure (on December 20th lol!!!). Hi Christine! I am not in the mood at all for making christmascards now, but I like yours! And yes: we are coming to the UK (England/Wales/Scotland) again in a few weeks, but won't be in your area I'm afraid... Looking forward to it already!! Hi Christine, two fabulous cards.